(fltr) HE Mr Thomas Mandigora, Ambassador of the Republic of Zimbabwe; HE Mbapeau Muvangua, High Commissioner of Namibia; Mr Thato Yaone Raphaka, Permanent Secretary Ministry of Environment, Natural Resources Conservation and Tourism in Botswana; Ralf Breth, Ambassador of the Federal Republic of Germany to Botswana - Special representative to SADC; Dr Nyambe Nyambe, Executive Director KAZA Secretariat; and Mr Domingos Gove, Director of Food Agriculture and Natural Resources SADC. 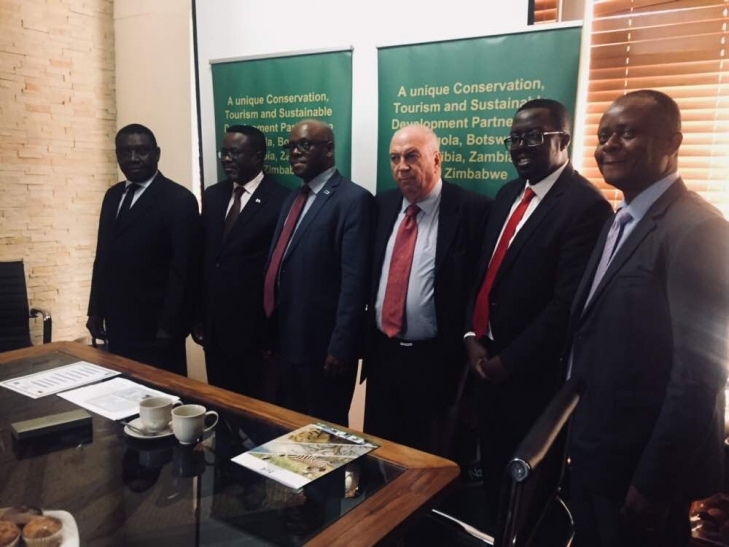 The German Government, through its development bank, KfW, has been closely involved in the development of the Kavango Zambezi Transfrontier Conservation area since its inception in 2006. This week, KfW demonstrated its continued commitment to the development of this significant conservation area, through the signing of a new funding agreement of €15,5 million for the period 2018 to 2022. 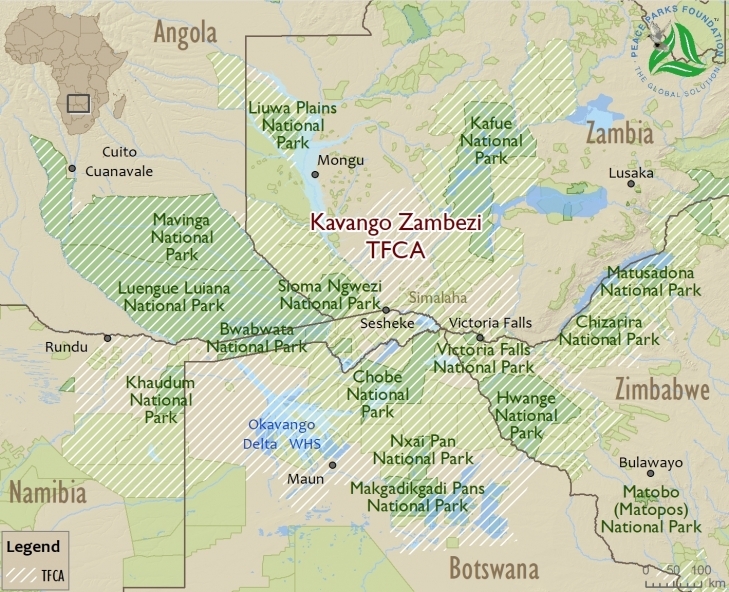 Roughly the size of France, the Kavango Zambezi (KAZA) transfrontier conservation area spans five African countries which include Angola, Botswana, Namibia, Zambia and Zimbabwe. It comprises 36 national parks, game and forest reserves, game and wildlife management areas, numerous community conservancies, and three Wildlife Heritage Sites. It is also home to the largest elephant population in the world. The area has a wide range of habitats that support diverse and many threatened or endangered species, terrestrial, aquatic and avifauna. (fltr) Ralf Breth, Ambassador of the Federal Republic of Germany to Botswana with Mr Thato Yaone Raphaka, the Permanent Secretary Ministry of Environment, Natural Resources Conservation and Tourism in Botswana. The funding agreement was signed between the German Government and the Government of Botswana. Botswana was selected to act as the representative of the five partner countries of KAZA. At the same time a Separate Agreement was signed to guide the expenditure of the funds, and a Project Execution Contract was signed that appoints Peace Parks Foundation as the Implementing Agent for the project. The agreement will see €15.5 million allocated to the development of the three priority Wildilfe Dispersal Areas (WDAs) over a four-year period. A core focus will be to implement projects which will secure these areas. Significant funding is also earmarked to initiatives that will ensure that communities benefit from the development of KAZA – be it through wildlife economy projects, tourism, sustainable harvesting of forest products, and/or climate smart farming techniques. 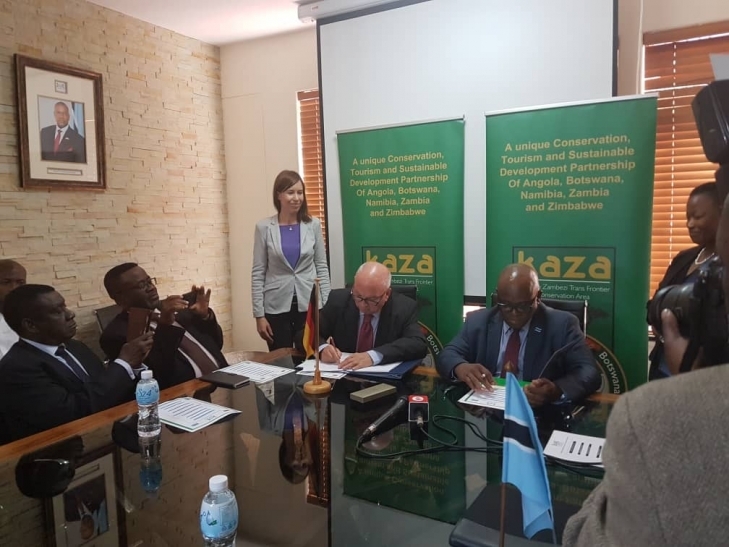 The main aim of the funding support for this next development phase will ensure that KAZA promotes regional integration and becomes the rural development initiative and conservation area it was set out to be. KfW support started in 2008, when €430,000 was made available for the initial project preparation. During this time the institutional framework for the implementation of KAZA was developed, which resulted in the establishment of the KAZA Secretariat to coordinate joint activities between the partner countries. The following year, KfW provided €8 million earmarked to support the operational cost of the KAZA Secretariat and also to support partner countries in improving infrastructure within the various protected areas. Each of the countries also developed an integrated development plan which was used as the basis to guide further investments. In August 2011, the Heads of State gathered in Luanda, Angola, to formalise their partnership through the signing of a KAZA treaty, thereby confirming their ownership and commitment to joining hands across borders to develop this transfrontier conservation area to the benefit of the region’s people. In 2013, KfW provided a further €12 million, which was again divided between the countries and used for further development activities, as well as the creation of a Master Integrated Development Plan. This plan determined that the most important activity for KAZA was to ensure that the various protected areas stay connected through the development of wildlife dispersal areas (WDA). These areas offer critical ecological and, in particular, wildlife movement linkages between protected areas across the landscape. The plan further stipulated that, as the WDAs impact on communal land, any projects that further the development of these areas should be implemented with great consideration to the needs of the communities living there. Six WDAs were identified and three of these were prioritised – the Zambezi-Chobe Floodplain WDA, the Hwange-Kazuma–Chobe WDA, and the Kwando WDA. In 2016, a meeting of traditional leaders was held, which provided a platform for engagement and collaboration, in advance of the State of KAZA Symposium which celebrated KAZA’s 10 years of existence. It also showcased its achievements and demonstrated progress made towards attainment of its objectives and its impact thus far. At the meeting, all efforts within KAZA were evaluated to highlight what was working well and why, and possibilities of replicating these successes, as well as what was not and why not. Recommendations made by attendees were harnessed for future direction.